By Ronald Rice and Booksellers Across America, ed. There is a wave of justified anxiety moving among the bookstore owners and patrons of America; the number of independent bookstores has been declining steadily since the 1990s. There has been a slight up-tick lately, from 1,400 members of the Booksellers Association in 2009 to 1,900 in 2011, but the opening of a new independent is news. The December 2012 issue of The Atlantic Monthly carries an article by the novelist Ann Patchett about her new store, Parnassus Books, in Nashville. The Athens of the South had no bookstore at all. Borders had closed and Davis-Kidd was not profitable enough. Why the decline in indies? The big box stores such as Books-A-Million and Barnes and Noble can exercise economy of scale; Amazon offers the convenience of online shopping and, these days, quick delivery. And e-books are quicker than that, magically instantaneous. Some writers, like Larry Kane, even fault the big publishers who show a “definitive lack of courage” and demand “guaranteed winners”: they promote already popular, best-selling writers. Still, writers and many readers love independent bookstores. This volume gives eighty-four writers a chance to praise their personal favorite. Make no mistake, eighty-four short essays on the same subject, “Why I Love My Favorite Bookstore,” contain a lot of repetition. Some things come up in almost every essay. For example: The owners and staff are knowledgeable. They are voracious readers, versed in the classics and up on the latest. Independent stores know their customers well but can also keep their secrets. As Richard Howarth of Square Books in Oxford, declares emphatically: “We don’t discuss our customer’s purchases. It’s nobody else’s business if you bought The Communist Manifesto or Fifty Shades of Gray. There are often easy chairs, quiet corners, unlimited browsing, sometimes an in-store cat, although, happily, several of the writers, poke fun at that frill. Sometimes there are cookies, often wine, coffee, or even full cafes. Many have a children’s section–the birthplace of a lifetime passion. Writers love small stores because they carry new, unknown, and local authors and small press books and have book launches and readings and signings. Many of these stores seem to have four or five a week. The local patrons must be overwhelmed. Sometimes the events exceed helpful and approach heroic. Explore Booksellers, in Aspen, had an evening to celebrate and support Salman Rushdie less than a month after the fatwa was decreed on his life. 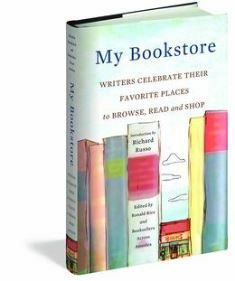 The Introduction to this book is by novelist Richard Russo, winner of the Pulitzer Prize for Empire Falls (2001), who has recently shown his support of book as art object by publishing a set of four short pieces, a novella and three stories, bound separately, each with a color print by his daughter Kate, in a beautiful boxed set. Titled Interventions, it is not available as an eBook. The stores praised in these essays are located nationwide, of course; ten are in California, nine in Massachusetts, and seven in New York. Even more than most independents, the Booksmith relies heavily on reading and signing events and a thriving, nationwide, signed first-edition club. Jake Reiss has found a way to sell books! For a state to have only two stores represented in this volume may seem paltry; it’s not. Arkansas is represented only by That Bookstore in Blytheville—although John Grisham is its advocate. Arizona, Georgia, Iowa, Idaho, Illinois, Kansas, Kentucky, Louisiana, Maine, Missouri, New Hampshire, Ohio, Oregon (but it’s Powell’s! ), Pennsylvania, Rhode Island, South Carolina, Tennessee, Texas, and Utah are also represented by only one. Alabamian Jack Pendarvis praises Square Books in Oxford, Mississippi, while Lemuria, in Jackson, is the favorite of Barry Moser. It ought to be; he fell in love with and married Emily, a staff member.